In this installment of our ongoing series, we’ll learn how to identify the Southern live oak and understand its place in coastal ecosystems. Quercus virginiana (from the Latin quercus, oak tree, and virginiana, of Virginia) is a common sight in coastal areas of the southeastern United States. It thrives in habitats such as coastal plains, woodlands, hills, and even sometimes sand beaches (4). Able to withstand salt spray, heavy rain, hurricane force winds, and short periods of flooding, it is well-adapted for these coastal environments (5). Because it is easily damaged by frost, the Southern live oak restricts itself to areas where the average winter temperature stays above 42° F (5). In these climates, it can keep its leaves nearly year-round, shedding and quickly re-growing them in early spring (5). Live oak is characterized by its dark brown, furrowed bark, small, tapered acorns, and small, leathery, oblong or elliptical leaves (5, 8). 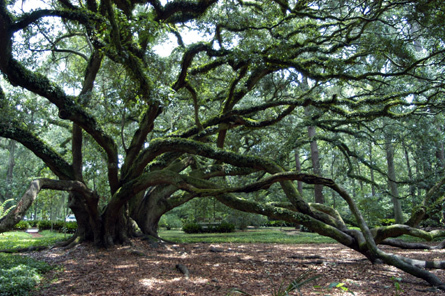 Mature live oaks can reach over 50 feet high and over 150 feet in diameter and can live for many centuries (5). However, the age of live trees is difficult to determine. The Angel Oak, near Charleston, South Carolina, is “often called the oldest living thing in the U.S. east of the Mississippi… [estimated at] over 1,500 years old,” writes Tim Bekaert, but “the second is almost certainly an exaggeration… an age of less than 600 years [is] more likely” (2). Even so, the Angel Oak would have been nearly a century old when Columbus first visited the Americas. Live oak is a dominant species in many coastal ecosystems. “[It] provides cover and shade for a wide variety of coastal species of birds and mammals. Acorns of live oak are an important food source for the Florida scrub jay, mallards, sapsuckers, wild turkey, black bear, squirrels and white-tail deer. Scrub jays, a threatened species, nest in live oak. Epiphytes of live oak include mistletoe, ball moss and Spanish moss. Spanish moss can be especially populous in live oak” (5). Previous: Introduction to the southern live oak. Next: Live oaks in southern cities and culture.